In this section, you will use refactoring to move a resource between Java packages. Refactoring actions change the structure of your code without changing its semantic behavior. 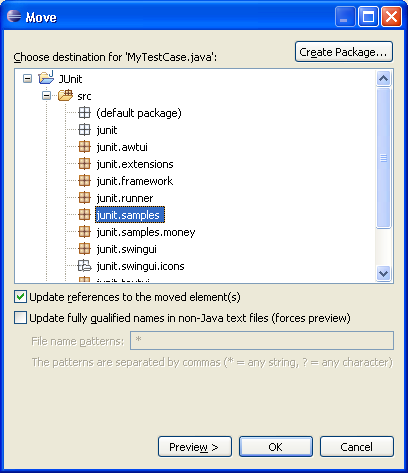 In the Package Explorer view, select the MyTestCase.java file from the test package and drag it into the junit.samples package. Dragging and dropping the file is similar to selecting the file and choosing Refactor > Move from the context menu. You will be prompted to select whether or not to update references to the file you are moving. Typically, you will want to do this to avoid compile errors. You can press the Preview button to see the list of changes that will be made as a result of the move. Press OK. The file is moved, and its package declaration changes to reflect the new location. Use Edit > Undo Move to undo the move. The context menu is an alternative to using drag and drop. When using the menu, you must specify a target package in the Move dialog, in addition to selecting the update references options you've already seen. 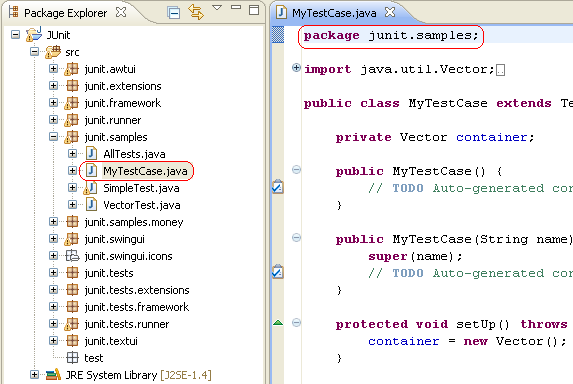 Select the MyTestCase.java file and from its context menu, select Refactor > Move. In the Move dialog, expand the hierarchy to browse the possible new locations for the resource. Select the junit.samples package, then click OK. The class is moved, and its package declaration is updated to the new location.